Closed fatigue cracks on the metal surface were detected successfully by using microwaves. A W-shaped characteristic signal was obtained utilizing a high spatial resolution sensor. Differing from the conventional technique, such as ultrasonics, the proposed technique does not need any coupling medium. The amplitude difference of the reflection coefficient, between the case that there was no crack and the case that a crack was under the sensor aperture, was observed to be in a linear relation with the crack depth. Therefore, it is possible to build an advanced method to evaluate closed fatigue cracks without any coupling medium. A crack is the most dangerous defect in machines and structures. Fatigue cracking often initiates from the surface, since the surface stress is often higher than the stress of inside when a metal is under load. Aircraft fuselage, pressure vessel and piping of chemical and power plants are examples where it often occurs. Therefore, the detection and evaluation of a small fatigue crack under a no load condition are utmost important issues for the integrity assessment of structural components [1-3]. However, it is very difficult to evaluate a small fatigue crack under a no load condition because the state of the fatigue crack, for example the width or the closure , is unknown. Commonly, beside the size of fatigue cracks, the closure stress will also affect the result of the measurement. Recently, some noteworthy researches have been reported that the closed crack was detected successfully by using ultrasonics, and the depth and the closure of the crack were also evaluated [5-6]. However, in those cases, a coupling medium such as water is essential because an ultrasonic wave cannot propagate in the air. In the present paper, we demonstrate a novel microwave nondestructive testing (NDT) technique, by which closed fatigue cracks can be evaluated under the condition without any coupling medium. Microwave is an electromagnetic wave having a wavelength of 1 to 100 mm . By comparing with ultrasonics, microwave has an advantage that it can propagate well in the air. Therefore, a coupling medium is not necessary when the nondestructive inspection is carried out . Since the 1970s, some researchers have attempted using microwave to detect surface cracks in metallic components [9,10], where a horn antenna was used. In recent years, some researchers have further promoted such researches using an open-ended rectangular waveguide in a near-field fashion [11,12]. However, a horn antenna or a waveguide has a cutoff frequency below which the propagation of microwave is impossible. Thus, the aperture of the sensor cannot be made sufficiently small, in order to ensure that the cutoff frequency is not higher than the operating frequency. Therefore, the spatial resolution is limited. That is the reason why those methods failed in detecting of a fatigue crack, while they have been able to detect a slit having finite width. In addition, in the cases of the horn antenna and waveguide, the electric field at their aperture is only in one direction for the dominant mode. Thus, if a scanning is carried out in the direction that the electric field is parallel to the direction of crack length, it is difficult to detect the crack. Recently, we have developed a microwave imaging system utilizing an open-ended coaxial line sensor to inspect the delamination in IC packages . Coaxial line can support transverse electromagnetic (TEM) waves without cutoff frequency for the fundamental TEM mode. Therefore, the operating frequency band can be broad, and it is also possible to decrease the size of the aperture for increasing the spatial resolution. Moreover, since the electric field at the sensor aperture is center of symmetry, the detection capability is independent of the scanning direction. where a is the attenuation constant and d the skin depth. where d is the depth of the crack. On the other hand, if a crack exists under the sensor aperture and the electric field is parallel to the crack, in other words, the magnetic field is perpendicular to the crack surface, no current is generated on the crack surface from Eq. (1). Therefore no microwave propagates in the crack. The amplitude r is the same as the case of no crack existence, r0. The constant a is related to the closure stress of the crack, and is a function of the operating frequency. Once a is determined, crack depth d could be evaluated by using the measurement result of DA. The configuration of the microwave inspection system is shown in Fig. 1. A network analyzer was used to generate a continuous wave signal that was fed to the coaxial line sensor and to measure the amplitude of the effective reflection coefficient, A, a ratio of the reflected wave to the incident wave, at the sensor aperture. The operating frequency was 110 GHz and the standoff distance between the sensor and the specimen was 60 mm. Cracks were scanned by the sensor in a plane parallel to the specimen surface, under a no load condition. The amplitude A was continuously recorded corresponding to the measurement position. A computer was employed to synchronize a stage and to create a one-dimensional graph or two-dimensional image. The open-ended coaxial line sensor of the microwave inspection system is shown in Fig. 2. The coaxial line sensor has an inner and outer conductor with a radius of 0.1 and 0.5 mm, respectively. The spatial resolution of the sensor was evaluated to be 125mm when the standoff distance was 500 mm at the operating frequency of 110 GHz. . Figure 3 shows the distribution of the electric field at the sensor aperture. For the fundamental TEM mode, the electric field is only in the radial direction between the inner and outer conductors. Fig 1: Configuration of the microwave inspection system. 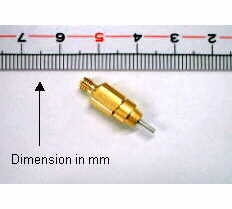 Fig 2: Photograph of the open-ended coaxial line sensor. Fig 3: Distribution of the electric field at the sensor aperture. Fig 4: Descriptive geometry of the specimen. To conduct the experiment, three closed fatigue cracks were introduced in different specimens, S1 to S2, respectively. Specimens were prepared as plates having the initial dimensions of 330´ 35´25 mm from the same materials of austenitic stainless steel, AISI 304 as shown in Fig. 4. To introduce a fatigue crack, an initial notch was situated in the L-S orientation of the plate, where the direction of crack growth was considered perpendicular to the longitudinal rolling direction, L, and parallel to the short transverse direction, S, of the material (ASTM code for crack plane orientation). The fatigue crack in each specimen was grown from the tip of the initial notch by cyclically loading the plate in four points bending of tension and tension on the dynamic testing machine. During the process of fatigue, crack growth was monitored from both sides of the specimen and the maximum value of the stress intensity factor, KImax , was determined with the average value of the crack depths measured on both sides of the specimen. The stress ratio, R, defined as a ratio of the minimum to the maximum value of the stress intensity factor, was maintained during the crack growth. After the desired depth of the crack was reached, the plate was machined and polished to remove the initial notch, leaving a true fatigue crack in the remaining material. The conditions used for introducing fatigue cracks in the specimens are listed in Table 1. Since fatigue cracks introduced in the same material under the same conditions as the present experiment had been evaluated to be closed by ultrasonic technique , the fatigue cracks introduced in S1 to S3 are considered to be closed. After the microwave inspection was carried out, the specimens were fractured for the measurement of the depth of the cracks. The value of the crack depth, d, indicated in Table 1 is an average of the measurements performed at the five locations in the direction of the specimen width on the fractured surface. Table 1: Conditions used for introducing fatigue cracks. Figure 5 shows a 3D view of the amplitude A measured by scanning the crack in the x- and y-directions for the specimen S3. The scanning area is 5´20 mm and the scanning pitches are 0.04 mm in x- and 0.5 mm in y-direction, respectively. As shown in Fig. 5, the crack is detected significantly. Figure 6 shows A measured by scanning the cracks in S1 to S3 in the x- direction at the center of the specimen width, where the value of A at the initial scanning point is calibrated as zero. As shown in Fig. 6, the shape of the graph indicates the result of the interaction of the microwave with the crack. When the crack is located between the inner and outer conductors under the sensor, the sum of the components of the electric field which is perpendicular to the crack takes its maximum value, thereby, the conductor loss reaches the maximum value. Therefore A shows the largest decrease. However, when the crack is located under the center of the sensor, no conductor loss will be generated in the crack because the electric field is parallel to the crack. Thus, the value of A is the same as that of the case of no crack under the sensor. Moreover, since the crack passes two times between the inner and outer conductors under the sensor, two decreased peaks of A can be obtained as shown in Fig. 6. Consequently, a W-shaped characteristic signal was observed. The relation of the microwave response with the sensor position for the detected crack is schematically summarized in Fig. 7. Also, the magnitude of the characteristic signal is shown to increase according to the increase of the crack depth, d. Here, the difference in the two peaks of the characteristic signal is due to an imperfect symmetry of the sensor. Hence, the average of the two peaks, P1 and P2 shown in Fig. 6, was used to calculate the amplitude difference DA. where symbols P1 and P2 express the magnitude of the two separated peaks of the W-shaped signal, respectively. 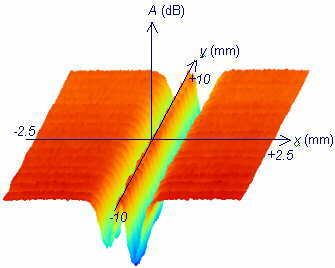 Fig 5: A 3D view of the amplitude of the reflection coefficient obtained by scanning the crack in S3 in the x- and y-directions. Fig 6: The amplitude of the effective reflection coefficient obtained by scanning the crack in S1 to S3 in the x-direction. It should be noted that the intensity of the microwave transmitted into the crack is significantly small, therefore, the characteristic signal is difficult to be measured if the spatial resolution and S/N are not high enough. Fig 7: The Relation of the microwave response with the sensor position for the detected crack. Fig 8: Relationship between the magnitude of the characteristic signal and the crack depth. Figure 8 shows the relationship between the magnitude of the characteristic signal,DA, and the crack depth d. For each specimen, the crack was scanned in the x-direction, at seventeen locations with a pitch of 2 mm in the y-direction. As shown in Fig. 8, the magnitude DA is observed to be in a linear relation with the crack depth d, which is consistent with Eq. (5). By using this relationship, once the characteristic signal is measured, the depth of the crack could be evaluated quantitatively. The detection of closed fatigue cracks by using microwaves under a condition of no contact and without any coupling medium has been demonstrated. A coaxial line sensor with high spatial resolution has been proved to be a powerful tool for inspection of small fatigue cracks. The magnitude of the measured characteristic signal was observed to be in a linear relation with the depth of the crack. Thereby, a promising new technique could be built for reliable quantitative evaluation of closed fatigue cracks without any coupling medium. We thank Mr. M. Mikami for help with preparing the specimens. This work was partly supported by The Ministry of Education, Culture, Sports, Science, and Technology under Grant-in-Aid for COE Research 11CE2003, and by Japan Society for the Promotion of Science under Grant-in-Aid for Scientific Research (B)(2) 13555023 and 13555192, and Encouragement of Young Scientists (A) 12750065. Buck O, Skillings BJ. Effects of closure on the detection probability of fatigue cracks. Review of Progress in Quantitative Nondestructive Evaluation, New York, 1982;1:349-53. Clark R, Dover WD, Bond LJ. The effect of crack closure on the reliability of NDT predictions of crack size. NDT International 1987;20(5):269-75. So KK, Sinclair AN. Size measurement of tightly closed surface cracks by surface acoustic waves. Nondestructive Testing Communication 1987;3(3):67-74. Elber W. Fatigue crack closure under cyclic tension. Engineering Fracture Mechanics. 1970;2(1):37-45. Saka M, Schneider E, Hoeller P. A new approach to detect and size closed cracks by ultrasonics. Research in Nondestructive Evaluation 1989;1(2):65-75. Ahmed SR, Saka M. Quantitative nondestructive testing of small, tight cracks using ultrasonic angle beam technique. Materials Evaluation 2000;58(4):564-74. Pozar DM. Microwave Engineering, Wiley, New York, 1998. Ju Y, Saka M, ABé H. Microwave nondestructive detection of delamination in IC packages utilizing open-ended coaxial line sensor. NDT & E International 1999;32(5):259-64. Hruby RJ, Feinstein L. A novel nondestructive noncontacting method for measuring the depth of thin slits and cracks in metals. The Review of Scientific Instruments 1970;41(5):679-83. Auld BA. Ferromagnetic resonance flaw detection. Physics in Technology 1981;12(7):149-54. Yeh CY, Zoughi R. Sizing technique for slots and surface cracks in metals. Materials Evaluation 1995;53(4):496-501. Huber C, Abiri H, Ganchev S, Zoughi R. Analysis of the crack characteristic signal using a generalized scattering matrix representation. IEEE Transactions on Microwave Theory and Techniques 1997;45(4):477-84. Ju Y, Saka M, ABé H. NDI of delamination in IC packages using millimeter-wave. Proc. the 17th IEEE Instrumentation and Measurement Technology Conference, IEEE, Baltimore, 2000;3:1597-602.